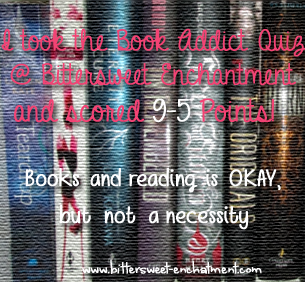 Bittersweet Enchantment: Are you a Book Addict? Take the quiz and find out! Today while reading I came up with a nifty idea (or at least I think so). 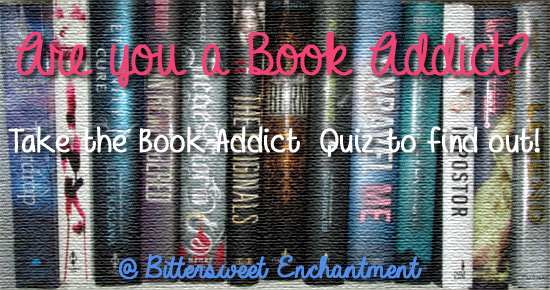 I've made a book addict quiz for anyone to take and to see who TRULY is an Official Book Addict. Everyone is allowed to take the quiz once. Once your finished you will need to add up your score either on a piece of paper or online somehow to tally up your total. The way to earn points is to answer the 25 question below (honestly, please) and give yourself 1 point for each one you said YES to. If you answer NO, then there is no point given. Once you've finished tallying up your score you will need to refer to the quiz results below to find out how you scored. 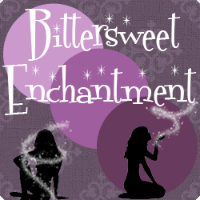 There will also be a small button you're welcome to take and display on your blog/website/facebook, etc letting everyone know totally hooked on books you truly are. Stay up really late to finish a book, all the while thinking "just one more chapter and then I'll quit." Cried in public while reading a sad part of your book. Wished or dreamt you could live in a certain book and be dating/married to a certain character. Squealed like a fan-girl while in a store in the book section, and noticed others looking at you funny. Read a book while dining at a restaurant. Have more books in your TBR pile than you'd ever finish reading in the next 25 years. Bought a book solely based on the cover alone. Walked while reading a book, not really looking where your going. Skipped meals because you didn't realize the time while reading. Bought a bookmark because it matched one of your books. Try to convert your NON-reading friends to read the same books as you and get upset when they turn you down. Literally yelled or cursed at the book when there was a part you hated or that shocked you. 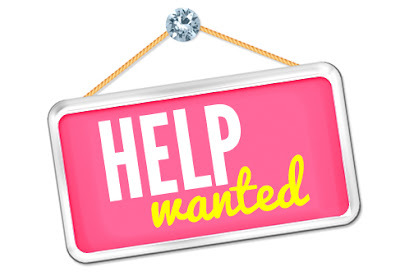 Own book merchandise, like buttons, t-shirts, totes, bookish jewelry. Would pay GOOD $$$ to get a ARC of a book before anyone else. 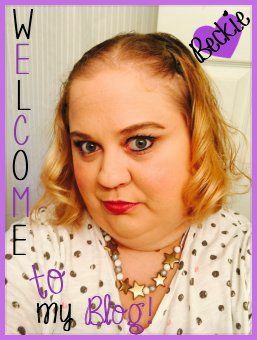 Has meet your favorite author and have signed copies of their book(s). Have literally hide someplace to read so no one could bother you. Have read while in the pool/hot tub/ or bathtub. Have written a letter to your favorite author and got a reply back. Have been over your limit on checked out books at the library. Have spent more than 100 dollars on books in one day. Got upset when you see someone treat a book badly. Could live without TV and Internet for a month or two, and only being allowed to read. Last but not least, make up dream casts for your favorite books. 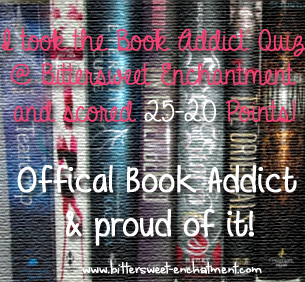 25-20 Points: It's official you are without a doubt a book addict! You LIVE, THINK, and BREATHE books. You're life would be incomplete without reading and books. 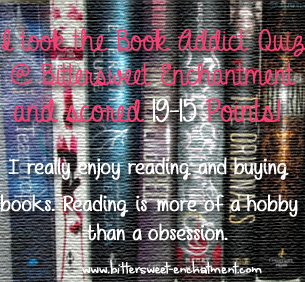 19-15 Points: You really enjoy reading and buying new books. Reading is more of a hobby than a obsession. 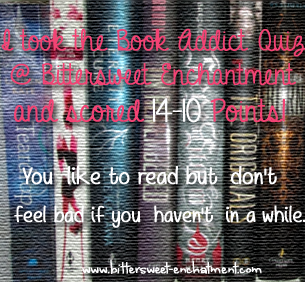 14-10 Points: You like to read but don't feel bad if you haven't in a while. You're more likely to wait and read new books once everyone else has. You buy books on occasion but not all the time. 9-5 Points: Books and reading is OKAY but not a necessity. You can go days without reading and rarely buy a book unless you really want it. 5-0 Points: Reading is not really for you. You hated reading in school and feel is not all that fun to do it now. Occasionally you may pick of a book but only if it's something that really interests you and is cheap. You may resize, if needed. This one can be taken and used by everyone if you don't want to use the ones above. 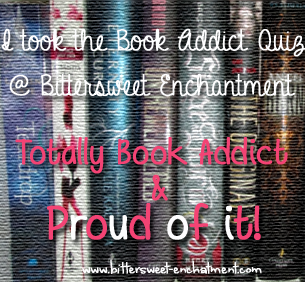 I really hope everyone enjoyed my book addict quiz. LOL! I scored 21 points! I guess it's official! hehe This was fun! 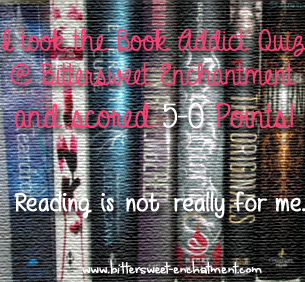 I got 14, but some of them were iffy..I did a post at my site http://www.bookaholicsanonymousonline.com/2014/01/are-you-book-addict-quiz-from.html lol with a more in depth reasoning.. The link was not valid. There was nothing there.